I'm also showing it here with the tank I usually wear under this one; a plain milk-chocolatey one from H&M. (I don't think you can tell here, but it matches a brown tone in the center of the First Prize rosettes.) Lots of you have commented about how deep the Duro necklines are, and I wanted to show you how I manage to wear them without being, in the classic words of somebody-or-other, a "cleavage-y slutbomb." (Not that I think cleavage is necessarily slutty, and of course it's the patriarchy that defines sluttiness anyway, always with an eye to perpetuating itself and controlling uppity women, but I just really like the word slutbomb. ) I also like having a chance to throw another color into the Duro mix with various tanks. 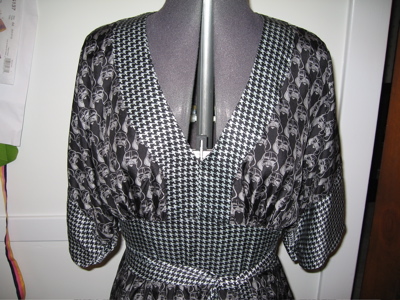 Not to mention being far too lazy to alter the pattern to have a higher neckline. I can't remember if I posted this one before, or not! (Do I repeat myself? Very well then, I repeat myself.) If I have posted it before, I'm sure someone helpful will post it in the comments. So, here, finally, is the Duro. It's not really pressed, and until I uploaded the picture I didn't realize it wasn't straight on my mannequin, but, nevertheless, here it is. And, yes, I know, that in the movie Vader really says "No, I am your father," with no "Luke" in there at all. How do I know this? I love the dotted fabric, and the fact that it's lined. 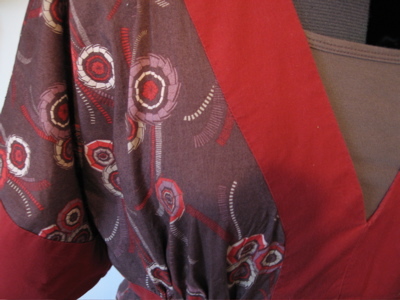 Personally, I'd like shorter sleeves, but this is for Fall 2007, so perhaps a more summery version would hit above the elbow. I think a summer version with flutter sleeves would be lovely. Of course, the only fly in the ointment is that her site is hugely flash-heavy. Why is it that designers feel they have to make their sites into largely unnavigable mini-movies? Is it a control issue? Do they all have family members in the employ of Adobe? Do they just not spend very much time using a computer? What is it? She also seems to have three other lines: the drapey , the more youthful , and the as-yet linkless Aquarius line, which is supposedly more vintage-inspired. 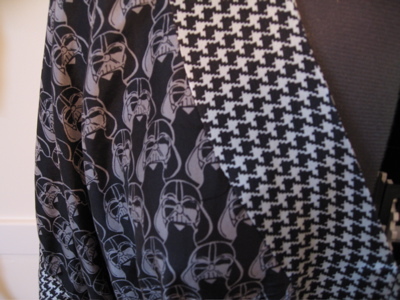 I also liked the Common Thread clothes, although they're a little too Williamsburg for me, if you know what I mean. I can't rock that "long hair and short baggy dress with floppy neck bow" aesthetic, although I think it's lovely on other people … worth checking out, though, because what I saw had gorgeous details. The price of a Singer sewing machine in the 1860s was $100 — $50 if you were the wife of a minister (which should tickle the writer of ; thanks to Sendhil for the link!). The Culture of Sewing also led me to (which I'll have to try to get from interlibrary loan), and , which I can't believe I didn't have, and will now have to buy. Seriously. I *love* stripes. 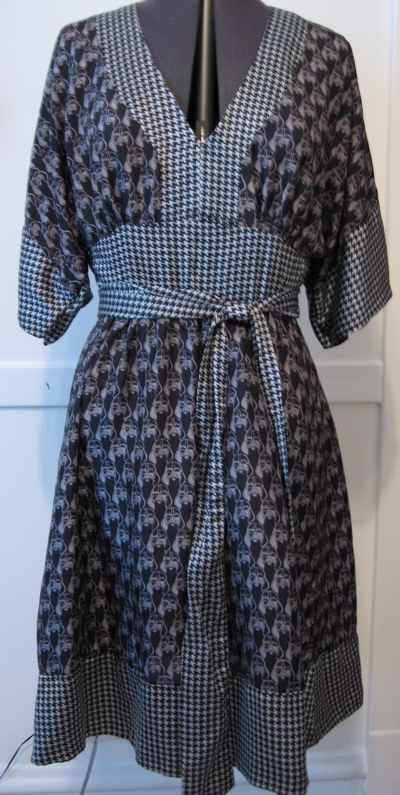 Especially ones done like these, on this dress from Anthropologie. ( sent me the link.) Click on the image to get a bigger picture; it's absolutely worth your time. And after about how I want to concentrate on yellow, gray, green, and baby blue for this spring/summer, red keeps sneaking into my sewing plans. I really love the red & light blue combo here, and I'm now obsessed with making a deep teal and black Duro with red piping … watch this space!